16, 18, 20 Dunearn Road. Freehold. Completed: 1992. (In Block 20, a 3-bedroom has 156 sq. m, see report below). Penthouse: 227, 306 sq. m. Some are 2-levels. 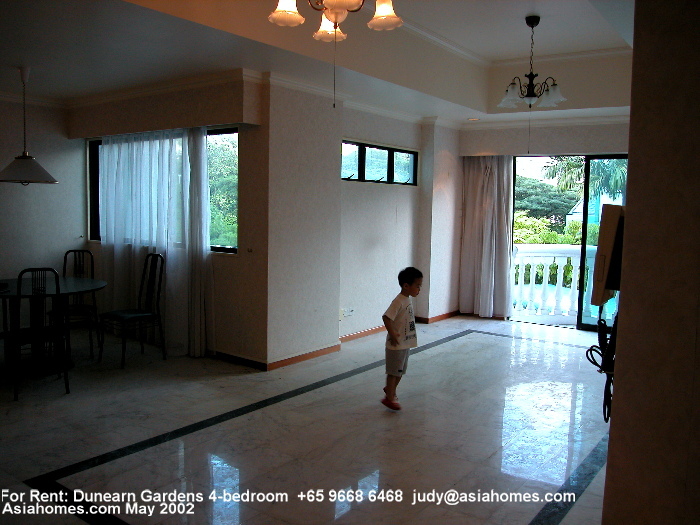 Greyish white marble tiles in the living and dining areas. Parquet in the bedrooms although some Owners have carpeted the rooms. The spacious kitchen has grey cabinets and German branded electric hobs, not gas. Gas cookers separately installed by some Owners, but you have to use tank gas. A large maid's room even for the 3-bedroom unit. Floor layout excellent as not much space is wasted. 2 balconies in 4-bedroom units, one in 3-bedroom unit. Advantages: Around a 5-minute walk to the Cold Storage supermarket and the Newton subway A small circular balcony off the living area makes the apartment attractive to Caucasians who love balconies. Full condo facilities include big lap pool, big children's pool. Playground, sauna, barbecue area, squash courts (2), tennis courts, gym, covered car park, 24-hour security. The condo is a favourite of expatriates who want to live near a subway, a supermarket and be a 2-minute drive to downtown Orchard Road. Main complaints are the dated looks of the kitchen cabinets and the multi-coloured long bath tubs, usually pink in the master bathroom in most units. However rentals are lower than brand new condos. Units in Block 16 ending with ......-01 and -04 faces a busy road. Slight traffic noise evident inside apartments although heavy curtains may shield traffic noise. Some tenants prefer gas to electric cooker jobs. Grey kitchen cabinets look outdated compared to new condos of the 2000s. The kitchen is spacious compared to those in the newer condos in 2011. Case study: Indians and personal lease. "I have learned not to be sensitive," said the Indian manager of a multinational firm. In Japan where he lived before the transfer to Singapore, Indians were not favoured, nor were Chinese who were said to be loud-mouthed. But there were sufficient open-minded landlords. In Singapore, some Landlords simply reject Indians as they think that curry cooking oil smells will pollute the apartment and realtors have to qualify the nationality of client. Some Landlords just want a corporate lease. In his case, there was a 3+1 1250 sq. ft Dunearn Gardens unit asking rent of $4,000. It was facing away from the main road, facing the pool. It had wall papers which had several brown water stains and dull white marble flooring. The Landlady was uneasy that the prospective Tenant was an Indian but was agreeable as the Realtor said he could get a corporate lease. The company's policy was no corporate lease for all employees. Therefore, he was rejected. He had been willing to accept existing furniture and non-polishing of the marble floor, a change of the torn window curtains and the removal of the brown stains and marks in the wall paper. The Landlord could receive rent within 24 hours! No was the answer. The obstacle was that the Tenant could only offer a personal lease. House-hunting for a good Dunearn Gardens condo. Report written in June 2000. Indian couple. Must be very near to the subway. Dunearn Gardens and Chateau Eliza (2 bedroom, 1200 sq. 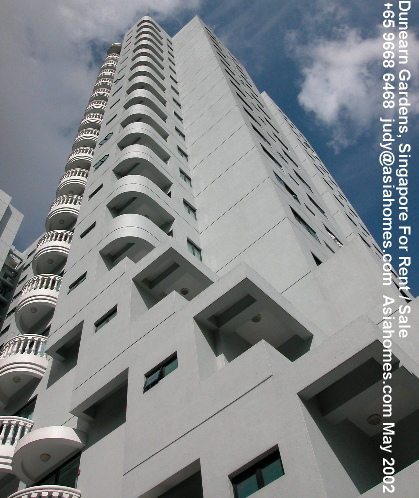 ft $3,300, close to Orchard subway but only a small pool) were 2 short lists. Meet at The Regent Hotel. Blk 16, ........-04, above 10th floor. Unblocked city views but slight traffic noise from Newton Road below. A big TV display cabinet extends out to block the view of the living room window when you enter the main door. The Landlord wants $3,500 for a fully furnished apartment and will provide new curtains. Blk 16, ......-01, above 5th floor. City views but slight traffic noise from Dunearn Road below. Small TV stand and TV, not obstructing the living room window views on entering the main door, makes this unit look bright and spacious. No living and dining set. The Landlord may consider $3,400 fully furnished but the broker said he was in China and therefore could not decide promptly. 4+1 1700sf $3700. The 4-bedroom units have longer living areas. Blk 16, ........ - 01, above 10th floor. Broker cancelled appointment as he was not free. Facing Dunearn Road and has traffic noise. Blk 20, ........-01, low floor. No view but quiet. Master bedroom is extremely large, but has no balcony. Bedroom 2 and living has balcony. A gas cooker was present in the bright and spacious kitchen as Dunearn Gardens units have only German branded electrical hobs provided by the Developer. Landlord has painted and cleaned up the apartment and therefore, immediate occupancy was possible. Off-white curtains and pool views. Incredibly tranquil compared to the road facing units. Some water leakage from the ceiling of the pink-bath tub master bathroom. Maroon-pink half leather sofa set not acceptable to the Tenant. Landlord agrees to give $800 to the Tenant to buy a fabric sofa set plus microwave oven and if the budget is exceeded, the Tenant will pay for the difference while the Landlord keeps the items. The demand for Dunearn Gardens is not great as there are so many new condos. It was a rare opportunity to get a 1700 sq. 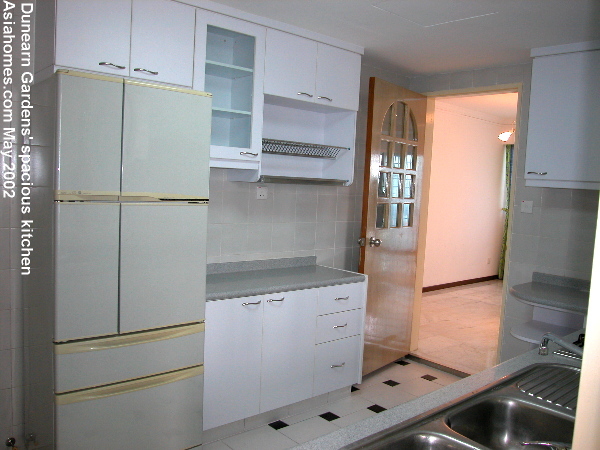 ft unit for $3,400 fully furnished. The Tenancy agreement was signed at 4 p.m at a rent of $3,400. A short 5 hours. Personal lease, couple with no children to wear out the apartment. The Tenant wanted to meet the Landlord to establish a good relationship. He accepted my advice not to do so as there may be bad chemistry on meeting. Nobody can predict. The Landlord had agreed to give a $600 furnishing allowance but wanted to reduce the amount to $500, according to the co-broking agent. If the prospect Tenant had met him, it may be the deal breaker if the Tenant dissented and the Landlord simply decided not to lease the apartment to him due to $100. Landlords nowadays must be investment minded. If your condo is over 5 years old, it will not be that hot. Take a personal lease and get the revenue in to pay for the mortgage or maintenance fees. That is the first objective of an investment. The property investment must pay dividends, i.e. rent in this case. A 3-bedroom unit of 1250 sq. 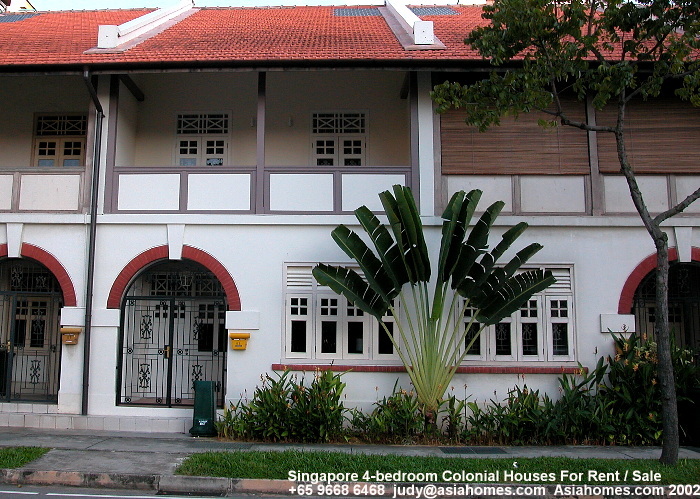 feet in Dunearn Gardens which is not well located in Orchard Road, offered a $3,400 rent is considered a good rent in June 2000. Two years ago, the rent will be $5,000 for the bigger units. Be decisive as you have lots of new condos on the market. A brand new Regency Lodge off River Valley Road of the same 1250 sq. ft rents around $3,000. No doubt it has only a swimming pool, but it is brand new. 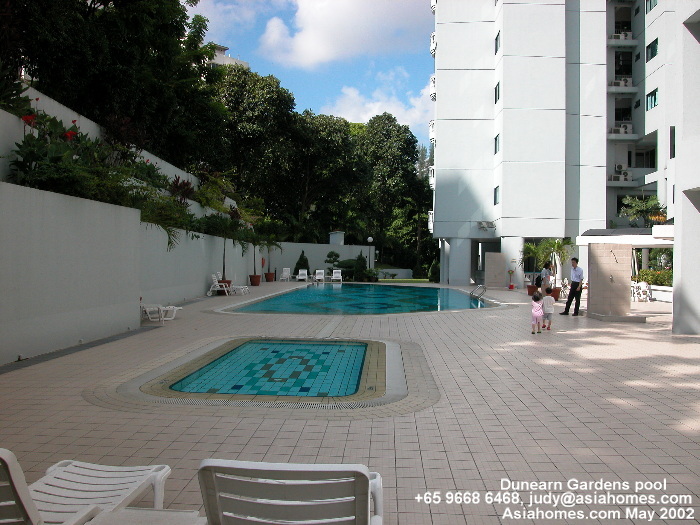 Due to the large influx of expatriates, Dunearn Gardens enjoy full occupancy as it is relatively new and near to the Newton subway which is just one subway stop from the Orchard Road. 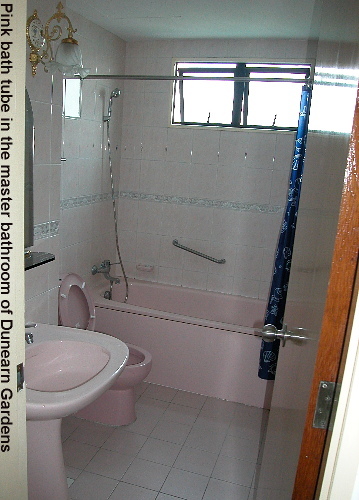 It will be very difficult to find a quiet big apartment for the expatriates at Dunearn Gardens now for a low rent. The right timing and the right place always play a great part in the prospective expatriate's search for a good home. The main challenge for the realtor is that of finding a good home with lower than market rental budget being offered by some corporations to the new Tenant. Older partially or not fully renovated condos will be the option if the rent is not sufficient and the expatriate wants a bigger apartment.